Seoul sources reported that Kim Jong Un, a smoking pistol in his hand, looks down at the dead body of Donald Trump, sprawled on a red carpet next to a metal bag overflowing with US dollars. Meanwhile behind the North Korean leader glows a neon slogan saying "The show must go on!" Furthermore the scene is part of an installation art exhibition in Seoul a satire of the diplomacy over the Korean peninsula that has become "a big political show featuring two of the world's biggest showmen." Reportedly the piece by South Korean artist Lim Young-sun marks the end of a whirlwind year on the flash point peninsula, during which Kim and Trump traded threats of war and personal attacks against each other before their dramatic, first summit in Singapore. Moreover the colorful war of words between the leaders of the impoverished but nuclear armed North and the world's top superpower as well as their highly publicized summit in June dominated global headlines this year. 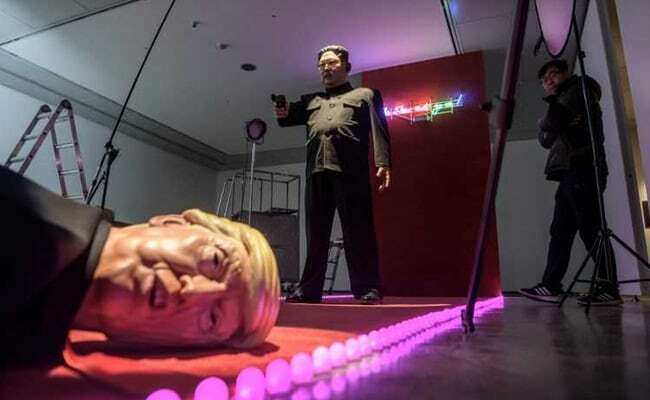 Reportedly the work portrays a film set, with Kim and Trump as friends and quarreling over money and eventually Kim, angered by the high interest rates demanded by Trump, shoots the lender to death.